Júlio Gonzaga Ramos was born in the Sé parish, in Porto, on 21 July 1868, and was baptized five days later in the Porto cathedral. He was registered as the son of António Caetano Ferreira and Maria Preciosa de Sousa, although he was the natural son of David Ramos, who came from a wealthy family in Guilhabreu, Vila do Conde, and was brother to Cândida Ramos, who later married physician José de Sousa Lamy. In 1882, he enrolled in the Porto Academy of Fine Arts, and was taught by João Correia, Marques de Oliveira, Soares dos Reis and Geraldo Sardinha. In 1886, during this degree, he received an honourable mention in a drawing competition, and two years later, an award and prize money in an Architecture competition. After completing the course, he pursued his studies in Paris as a State bursary student (1891-1897). During his stay, he attended the École des Beaux-Arts and Julien's workshop, supervised by masters Jean Paul Laurens, Benjamin Constant, Jules Breton and Loys Valteil. 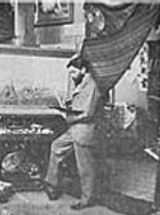 He exhibited his work at the Salon twice (in 1896 and 1897), accompanied by António Nobre, for whom he designed the illustrations, together with Júlio Brandão, for the second edition of the book "Só" (Alone)(1898). In 1897, he returned to Portugal and dedicated his time to painting, especially the landscapes in rivers Ave and Lima. He exhibited his work for the first time at the Porto Academy of Fine Arts, and in the following year he collaborated in the third issue of the "Ilustração Portuguesa" magazine, of 1 August, with drawings of country life. From then on, he took part in many exhibitions in Portugal and abroad (Porto, Lisbon, Paris, Rio de Janeiro and Berlin), and received prizes in some of them (2nd Gold Medal from the Grémio Artístico de Lisboa, in 1898, 3rd Medal at the 1900 Paris International Exhibition, and the Gold Medal at the 1908 Rio de Janeiro National Exhibition). In addition to painting, he was also involved in teaching and other artistic activities. He lectured at the Faria Guimarães Industrial School (nowadays Soares dos Reis Artistic School) between 1923 and 1938, and welcomed painting students in his Porto workshop, in Campo Lindo Street, close to the house where he lived. He was a scenographer and played the "violão" (a large type of guitar) at the Sociedade Dramática d'Amadores da Cidade do Porto; he wrote articles on Architecture published in several journals ("O Primeiro de Janeiro", as the artistic director, "Comércio do Porto Ilustrado", "Ilustrações Modernas", in 1898, "Serões", in 1907, "Arte", in 1908, and "A Águia", between 1910 and 1911), and participated in the illustrations of books by Júlio Brandão and Aurora Jardim. He died in 1945, at the age of 77, in Freixo, Guilhabreu parish, from hepatic colic.